When you’re using email to job search or network, it's important to include a professional email signature that has all of your contact information. This makes it easy for hiring managers and recruiters to get in touch with you. Read on for advice on what to include in your email signature, and how to set one up on your email account. First, make sure that the email account you are using for your job searching is a professional one. You should have a simple, professional email handle such as FirstnameLastname@gmail.com. If you’re not sure how to set up an email account, review this guide on how to set up an email account for your job search. An email signature appears at the bottom of every email and includes all of your important contact details. An email signature includes much of the same information that you would include at the top of a typical business letter. The format of an email message is not the same as a written letter. For example, in a business letter, you include your name and contact information at the top of the letter. You do not include this information at the top of an email. Instead, it goes in your email signature. At a minimum, an email signature should contain your full name, your email address, and your phone number, so that hiring managers can see, at a glance, how to contact you. You might also include your current job title, and the company you work for, and your full address. Including a link to your LinkedIn profile is a good way to give the hiring manager more information on your skills and abilities. You can also add a LinkedIn button to your email signature if you prefer. You might also link to your Twitter account if you are using it for job search and/or career-related purposes. For applicants in creative fields, such as writers or designers, adding a link to an online portfolio is an excellent idea, or if you have your own professional website, you can add a link to it. Don’t get too carried away and be wary of including too many links in your email signature. Just link to the most important information. Before you add every possible URL where you appear online, consider where you'd most like people to click. For example, if your LinkedIn profile encapsulates your career history best, use that. If your Twitter feed showcases career-related skills (e.g., marketing abilities), a link there may be more meaningful. But you don’t need both. Also important is leaving things out that don’t belong in an email signature when you’re sending emails related to your job search, such as inspirational quotes in their signatures. While adding cute inspirational quotes are fine for personal emails, it’s just not professional enough for a work-related email. See a variety of email signatures below. All of these would be appropriate to use when job searching. If you want to use any of these examples, be sure to change any information so that it fits your personal circumstances. Each email server has different steps you must take to set up your email signature. Typically, you can click “Settings” on your email account, and find a tab that tells you how and where to add a signature. Once you add a signature, this should automatically be added to all of your outgoing messages. This means you do not actually have to write in the signature every time you send an email — it will automatically be added to the end of your email. There’s a lot you need to know about etiquette when using your email for job searching. 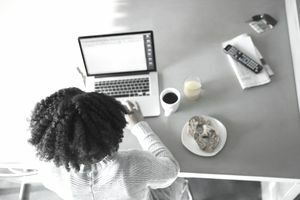 Review this guide to job search email etiquette to learn more about what to write in your job search emails, how to format your email, how to make sure your email message is read, and sample job search email messages.